Small parcel only orders (lighting and accessories) will arrive to your home between 3 - 7 business days from placing your order. For furniture orders: Once you have placed your order, our Customer Care team will contact you to finalize delivery arrangements, with your items arriving within 3 - 4 weeks of placing your order. To determine which of the below shipping methods apply, please place the items you wish to purchase in your cart and enter your shipping address to receive your shipping options. You may also expand the shipping section on any product page and input your zip code for your estimated shipping cost. *Some exceptions to the Zone 1 (25-mile) coverage range apply. I need my order to arrive on a specific day. Is that possible? Please contact Customer Care to determine if your specific date request can be accommodated. 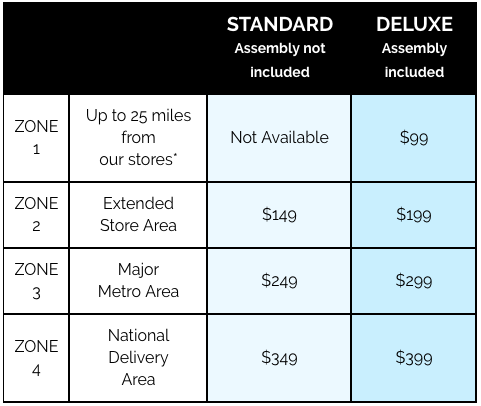 For orders outside the range of our stores in ZONES 3 and 4 (see chart above), Customer Care requires anywhere from 4-6 weeks to target a specific delivery date. If you have specific dates by which you need to receive your order, please contact us at hello@scandinaviandesigns.com or (844)722-6347. Can I buy online and pickup in store? At this time, we do not offer online ordering with store pickup. All online orders will be shipped to your home. For store pick up, the purchase must be made in-person at the store. Note that certain furniture items are not available assembled when they are picked up at the store. When my new furniture is delivered, will you remove my old furniture? The delivery companies we work with are only insured to handle the furniture that we send with them, nothing else. It is your responsibility to clear the area where your new furniture will be placed prior to delivery.